The Medina family lives by the rhythms of the seasons. In spring, they take to the road, heading north from farm to farm to pick crops. In autumn, they return home to South Texas, not far from the Mexico border. As in many migrant families, the children attend school when and where they can. Such disjointed schooling, coupled with language barriers and poverty, poses a critical challenge for migrant students, who drop out at a rate 3 to 4 times higher than the national average. In Texas, SEDL is addressing this need by helping the state give migrant children a strong start. In 2012, our Texas Comprehensive Center (TXCC) partnered with the Texas Education Agency (TEA) to develop Stepping Stones: A Texas Migrant Early Childhood Program for 3- and 4-Year-Olds. This free home-based program provides the state’s migrant coordinators and home educators with research-based materials aligned with the latest Texas prekindergarten standards. Available in English and Spanish, the program includes 100 lessons in 10 units, with a heavy emphasis on language and literacy development. Many of the lessons feature children’s literature as well as strategies parents can use when reading to their children to build their vocabulary and comprehension. In addition, a manual guides migrant coordinators and home educators in effectively implementing the program. The TXCC team worked with TEA staff in both the federal programs and curriculum divisions to organize and facilitate the planning, development, training, and pilot for Stepping Stones. This work provided assistance in statewide coordination and key expertise in early childhood education and curriculum development. 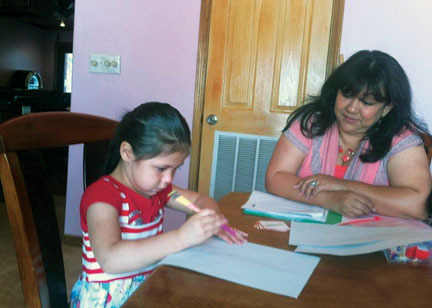 Stepping Stones empowers migrant parents to become their child’s first teacher. With initial guidance from a home educator, parents learn everyday activities they can do to help their children build literacy and language skills and develop a solid foundation in learning, even while on the road. For more information, please contact SEDL project director Edward Tobia at ed.tobia@sedl.org or at 800-476-6861, ext. 6560. Copyright ©2018 American Institutes for Research. All rights reserved.